When a new person shows up at a critique group they are often intimidated or embarassed when asked to critique another’s work. They aren’t English professors or best selling novelists, they protest. We contend, however, that they are entirely qualified to critique. They are, after all, readers! 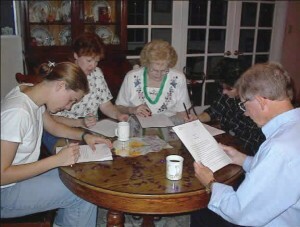 Critique group newbies may not be able to hightlight point-of-view errors or catch every misplaced comma. They can, however, identify which parts of the piece confused them, where they lost interest, or what struck them as especially useful or funny. Just remember to use the sandwich rule when giving critique to others: start with something nice, identify where the piece could be improved, and end with words of encouragement. Every reader has input that can be valuable to another writer. Find a critique group near you. Before joining, please contact us to make sure the group is not full. + BEACH CITIES: 3rd Tue. at 9:00 a.m. Hosted by Mary Kay Moody. Email for waiting list info. + NATIONAL CITY: Email for meeting time/location. Bill Bagot leader. + NORTH COUNTY COASTAL: Barbara Waite hostess.